Jan has been using GNU/Linux since 1996 and has had 2 unintentional re-boots since then (not counting re-boots due to power failures). 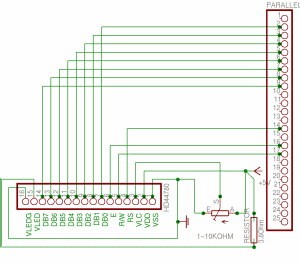 This article is trying to teach you a thing or two about the HD44780 compatible LCD-display. We will go through how to connect it to your parallel port and how to program it with a small program called LCDInfo as a reference. You're not supposed to just connect the display, run a program and get all you need on the display but also understand how the hardware can do what you want. First, you need to get some hardware and software, I assume you already have a computer with a standard parallel (printer) port on which you can run GNU/Linux with gcc and glibc. You will also need a LCD display which is HD44780 compatible, cables to connect this to your parallel port and also a potentiometer if you want to change the contrast. To power the display you will most certainly need more juice than your parallel port will give you and you might need to get the power from somewhere else in your computer. The best way to do this is by using a standard +5V connection (the ones used to power disk-drives, hard-drives, etc). When you have connected the LCD display you need to know how it works. This is what usually is left out in other articles on the subject but I will try to explain some of the internals of the display which will help you program it. The last thing to do is to actually make the display print something useful. As a reference I will use a small program called LCDInfo which has support for most features of the HD44780 but doesn't print much at the moment. This program is alpha and I work on it when I have spare time. If you have never programmed C before you might want to consider reading a bit on C, I assume you are a beginner in C since that is my current level. First, let's look at the different pins available on the LCD and explain what they do. Pin 1 is called VSS and is supposed to go to GND. Pin 2 is called VDD and this is the power supply pin which is at +5V. Pin 3 is called VLC and is connected to the potentiometer to decide the contrast of the display. Pin 4 is the RS pin and depending on this pin the display prepares to get instructions or data. Pin 5 is the R/W pin and this controls whether the LCD is sending or receiving. Pin 6 is the Enable pin. When this goes from low to high and then to low again the LCD reads pins 4,5 and 7-14. Pins 7-14 are the data bus line called DB0-DB7, these are the main data bits sent to the LCD and controls where and what to be written on the display. Pins 15 and 16 are only present on displays with back lighting and are simply +5V and GND with a 3.8 Ohm resistor between pin 15 and +5V. To find out where you should connect these on the printer port you can look at the schematic on the right where i have tried to make this as clear as possible. Click on the schematic diagram for a bigger picture. This schematic only applies if you want to change the contrast of the display. I simply connected pin 3 and pin 1 to GND which works OK for me, if you have strange lighting in the room you might want to consider adding the potentiometer though. When getting the power from the PC please be careful. If you take the power from the wrong cable you will get +12V which will fry your LCD. The cable you want is the red one. Yellow is +12V and black is GND. If you have done this right the LCD should have the first (and third if it exists) row black when you turn on the PC. The LCD doesn't do anything until you tell it to, it simply waits until it gets a valid enable rise and fall (which is when we put the enable pin high, wait for a while and then put the pin back low). At this point the display reads whether it is instructions or data to be processed, then whether it will receive or send information and last the data bits are sent or received. In this article we will never receive information from the LCD so the R/W pin will always be low which means write. The RS pin will be low except for when we print characters, everything else is considered instructions. This makes it really simple to program the display. When we know this we want to start with turning the display on and make it ready to receive information. This is done in the initialization sequence where we tell the display to be turned on, which "function set" to use, etc. The power should already be on if you get the power from a spare power cable in the PC, otherwise this is the first thing to do. Next is the "Function set" which is dependent on what display you have. To make it more easy to understand I will explain exactly what we do when we use the function set. DB2 is the Character Font bit and this should be low meaning 5x7 dot matrix. DB3 is the Display Lines bit and should be high meaning 2 lines. What if you have 4 lines on the display? Don't worry, the first and third line are the same in the display memory so you should use high to. 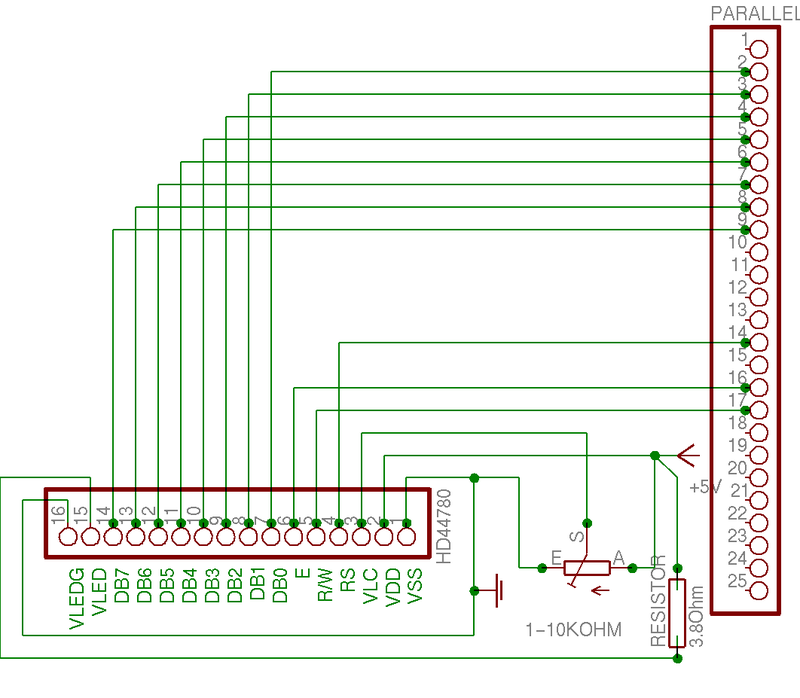 DB4 is the Data Length bit and this decides if you have 4 or 8 DB, if you connect the display according to my schematics you should have this DB high. Then set DB5 high to tell the display that this is indeed a "Function Set" instruction, then make sure that RS and R/W is low and do a enable rise and fall. For timings check the manual, i assume we only pause for microseconds when waiting for the display which should be much more than needed. Here I will discuss the parts of the LCDInfo program which you need to understand how the interface of the HD44780 works. You can download the LCDInfo program at the end of the article or take directly a look at of the c-code files iolcd.c and lcdinfo.c by clicking here. What we need now is the above instructions written in C and believe me when i say its easy. I will go through the code step by step and even if you are a C beginner you will understand. First of all we include some header files and define functions (check the source for info). Then comes the fun part. This is the first instruction in the main function which gives us permissions to the parallel port. BASE should be 0x378 or something and the "3" part means we have access to 0x378, 0x379 and 0x380 which basically is the whole printer port. The reason there are three addresses is because the port is divided between data, status and control. For us this means we have to set the data pins first, the control pins second and we cannot do this in one command. Next thing to do is the function set described above. This sets the DB pins to 5x7 dot matrix, two lines etc. This sets the RS and R/W pins to instruction and write. I have made global variables of I_REGISTER and WRITE_DATA and they equal 2 and 8. Next is the enable rise and fall. What this code does is basically puts the enable to high, wait and put the enable to low. The command for the usleep(0); is not really ideal but i have not finished the timing code for the display. Quite a few of you might wonder why I turn the RS and R/W on in the code when I say that they should be put low in the instructions. This is because pins 1, 14 and 17 are "hardware inverted" meaning that if pin 14 is "off" as far as the printer port is concerned, the pin is high! Well, I told you it was easy, didn't I? Maybe you want to have some practical use for your display also, like displaying text? No problem. As you can see we changed "I_REGISTER" to "D_REGISTER" and "56" to "character" but what does this mean? If you look at the character codes in your manual you will understand. We only need to feed the function a character (since we use C we do not even have to bother making it an integer first) and then the character will pop up on the display. Neat, huh? With this code you have the bare bones of an LCD program, use it to fit your needs, display free mem, display active http connections or whatever. Some examples are in the LCDInfo program which displays some things available in the proc filesystem on a GNU/Linux computer. For info on LCD programs, check http://lcdproc.omnipotent.net/ which is a good LCD program. Thanks to Sven and Reinhold for some pointers. The Source code of the lcdinfo program: lcdinfo-0.02.tar.bz2.